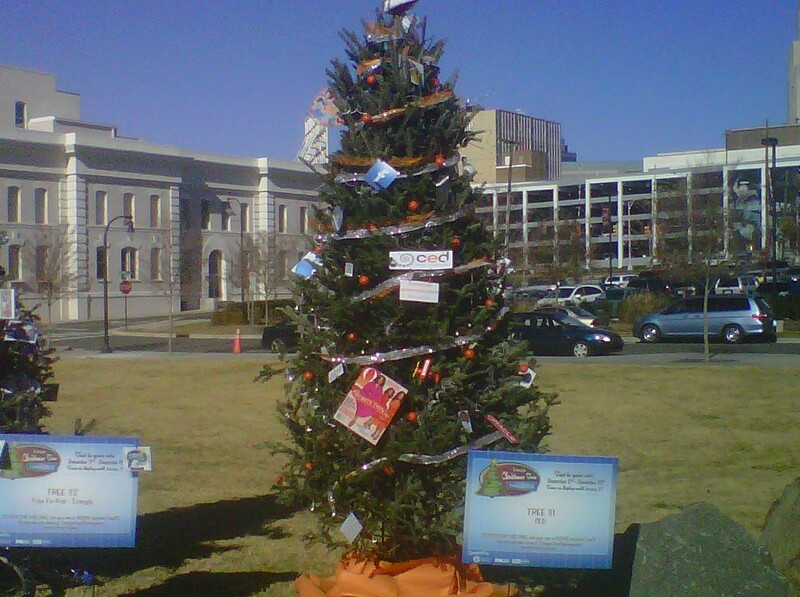 Start Something, the CED Blog: Vote for CED in the Triangle Christmas Tree Challenge! Vote for CED in the Triangle Christmas Tree Challenge! Voting is now open for the Triangle Christmas Tree Challenge, and we need your help. The trees that receive the most votes qualify for up to $5,000 in prize money. As you know, the mission of CED is to accelerate the entrepreneurial culture of the Research Triangle and North Carolina. Likewise, our tree has the theme: "Accelerating Entrepreneurship". With our theme in mind, we have decorated our tree with ornaments representing some of the world's most famous entrepreneurs from all walks of life--Steve Jobs, Thomas Edison, Mark Zuckerberg, Jim Goodnight, Michael Jordan, and many others. To CED, these entrepreneurs and their products represent the greatest attributes of entrepreneurship--passion, creativity, innovation, and impact--all attributes which we hope to continue to grow to ignite the entrepreneurial culture of North Carolina. CED is financially secure, yet an additional $5,000 would allow us to rapidly accelerate programs like our Venture Mentoring Service or FastTrac and allow us to impact even more emerging companies and the entrepreneurs that run them. Voting ends on December 18, so vote early (today!) and often! Please share this opportunity to grow the community of entrepreneurs and spur future job growth in the Triangle with anyone that cares about the entrepreneurial community and creating job opportunities in the Triangle. We hope you'll have the chance to visit our tree--it rests outside of the Durham Performing Arts Center (DPAC) on the lawn. Stationed among many other trees, representing many organizations that help Durham run, we think that it would make a great holiday activity for you and your loved ones to stop on by for a visit.